Once in a while I get into a phase where I crave certain flavor profiles and that dominates what I cook for at least a week. Well, a few weeks back I was craving ingredients like soy, miso, scallion and snap peas, so pretty much everything I made that week had an Asian flare to it, like the Asian Meatloaf that I recently posted. One particular evening I was not only craving those flavors, but I also wanted seafood, and done in a way that was comforting… so I decided to make an Asian Noodle Soup and incorporate shrimp, scallops and fresh vegetables. It came out absolutely delicious, quite possibly one of my best dishes in a while! Another great thing about this recipe is that from prep to plating you should be done in about an hour. Serves 4 as an entrée, 8 as an appetizer. In a large sauce pot (I used an 8qt) heat 1tbsp of olive oil on medium, then add the garlic, sliced lemongrass heart, grated ginger and sprinkle with 1/4tsp of salt, sauté for 3 minutes. Add the vegetable stock, water, soy sauce and 1tsp of salt. Increase the heat to high and boil uncovered for 20 minutes, stirring periodically. Strain the broth into another pot to remove any solids, do not put the strained broth on heat. Add the uncooked vermicelli, shrimp and scallion and cover the pot, allowing the hot broth to cook the raw ingredients. Leave covered at room temperature for 15 minutes before serving, stirring once about halfway through. While the broth is finishing it’s time to cook your scallops. Rinse them off in cold water, then pat dry with a towel. Sprinkle both sides of the scallops with salt and pepper. Heat the olive oil in a saute pan on high. Once hot add the scallops and sear until browned, then flip and repeat, 2-3 minutes per side. Put the scallops in the oven for 5 minutes to finish cooking. 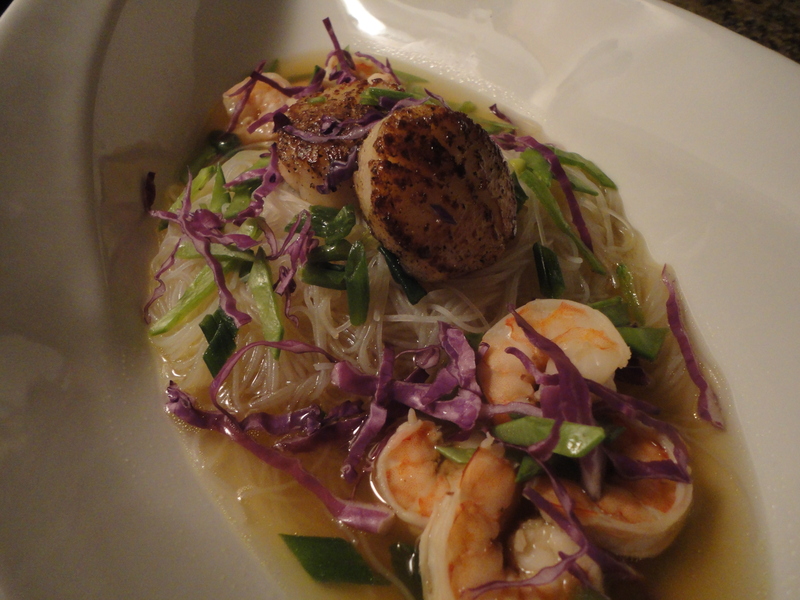 To serve, create a nest of vermicelli in the bowl and ladle with broth and shrimp. Top with the seared scallops then liberally garnish with julienne snap peas and shredded cabbage. Now let’s talk pairings. If you’re having wine then it’ll have to be white… red wine simply isn’t going to work. Look for whites with pronounced acidity and subtle fruit and florals, which will help cut through the soy but also accent the natural sweetness of the seafood and vegetables, but that also have some depth and richness. Think Bordeaux Blanc, dry Alsatian Riesling or Gewurztraminer, dry Chenin Blanc, or even a denser Sauvignon Blanc from California, preferably Napa. Or if you’d like to go in a different direction I would recommend a floral Sake from a southern Japanese prefecture, or even a lighter bodied beer with subdued hops and notes of florals or fruit. Here are a few things that I would recommend. Well, there you have it, my newest recipe and recommended pairings. I must point out that this is a momentous post as it’s my first with a beer pairing included! Hopefully you’ve enjoyed the read, and will try the recipe and pairings. As always new content is coming soon, in the meantime crack open a dangerously addictive bottle of Elder Betty, sit back and relax… and keep the rest of the six pack within reach so you don’t have to keep getting up for another! Life is short, enjoy it. Tags: asian, beer, broth, cooking, eastern cooking, food, perfect pairings, perfect pairings at home, recipes, sake, scallops, seafood, shrimp, soup, vermicelli, wine. Bookmark the permalink.